HWMO spearheaded the effort to write and implement this 2016 South Maui Community Wildfire Protection Plan (CWPP). 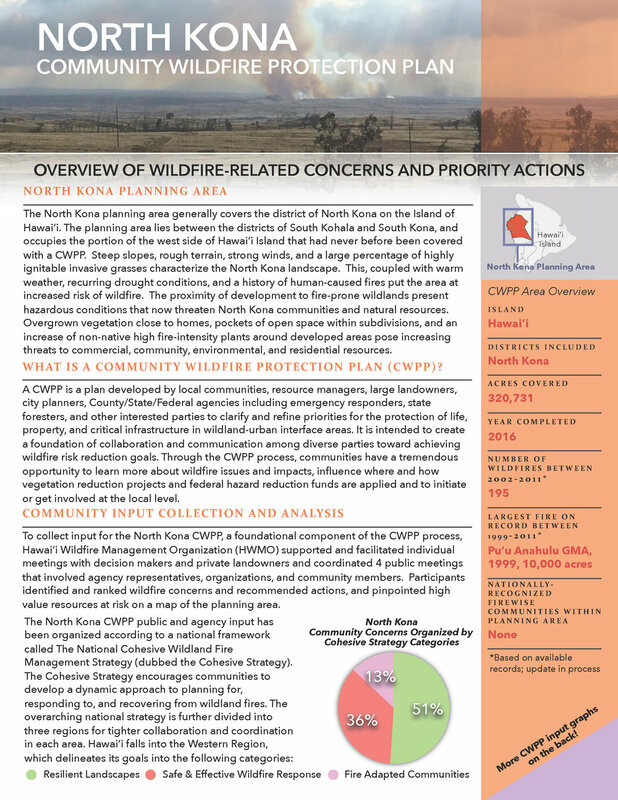 HWMO spearheaded the effort to write and implement this 2016 North Kona Community Wildfire Protection Plan (CWPP). HWMO spearheaded the effort to write and implement this 2016 Molokai Community Wildfire Protection Plan (CWPP). HWMO spearheaded the effort to write and implement this 2016 Kauai Community Wildfire Protection Plan (CWPP) Update. Find out what our staff is saying about HWMO and visualize the projects we have been working on the past few years in our new infographic. In 2016, Maui had its worst wildfire season in many years. With barely any vegetation left in the burned areas to hold down silty soils, a mid-September storm rained down on the burned lands and carried trash and debris through our watersheds and out into the ocean. This video tells the story post-fire flooding and its impacts on our communities, lands, and waters. Footage of post-fire flooding was filmed in West Maui on the days following the September 13th storm. Music by Bensound.com - "Piano Moment"
This video was made possible through the support provided by U.S. Forest Service, Pacific Southwest Region, under the terms of Grant No. 16-DG-11052012-146. The opinions expressed in this video are those of the author(s) and does not necessarily reflect views of the U.S. Forest Service. USDA is an equal opportunity provider. On May 13, 2016, a number of governmental and non-governmental partners released a statewide campaign called Wildfire & Drought Look Out! to inform residents and visitors of Hawaii to take action to prevent and prepare for wildfires. Tagged: Videos, Wildfire & Drought Look Out!, Evacuation Procedures, Firewise Homebuilding & Landscaping, Ready Set Go! 1st Press Release for the May 13th launch of the Wildfire & Drought Look Out! statewide campaign. Tagged: Wildfire & Drought Look Out!, Evacuation Procedures, Firewise Homebuilding & Landscaping, Ready Set Go! The Nanakuli Fire in March of 2016 threatened a number of homes along the edges of the valley. However, some precious native plants were also in the path of the destructive fire. Here's the story behind what happened and the larger lesson of how wildfires impact Hawaii's native ecosystems.